A day after feisty farmer protests in the National Capital Region (NCR) and just before the Assembly poll schedules for Madhya Pradesh, Rajasthan, Chhattisgarh and Mizoram were announced this week, the central government declared the minimum support price (MSP) for the 2018-19 rabi crop season, marketing for which begins from April 1, 2019. As with the kharif MSPs, the ones for rabi followed the pre-determined formula of 50 per cent above the A2+FL cost (which basically covers all paid-out expenses in cash or kind, plus an imputed cost of family labour). On this basis, the MSP for wheat of Rs 1,840 per quintal is a hefty 112.5 per cent more than the cost of production; for gram the MSP of Rs 4,620 a quintal is almost 75.2 higher; for masur (lentil) the MSP is 77 per cent more; and for mustard almost 90 per cent. On the face of it, it can be said that the government has gone beyond its promise of guaranteeing MSP at 50 per cent over cost for a second successive season. In actual terms, this rise in MSP may be misleading. For wheat, calculations show that between 2017-18 and 2018-19, the cost of production has risen 6 per cent, from Rs 817 per quintal to Rs 866 a quintal, and the MSP during these two years has grown 6.1 per cent. Similarly, for gram, the A2+FL cost has grown from Rs 2,461 a quintal to Rs 2,637 a quintal, or 7.15 per cent, against a growth in MSP of 5 per cent. There are exceptions such as safflower, where production costs rose 5.4 per cent against an MSP growth of 20.6 per cent. But safflower is a minor crop in the basket of rabi crops and its procurement is limited, so this significant increase has a limited impact. In fact, data compiled by the Commission for Agriculture Costs and Prices (CACP) show that despite the government’s best efforts, MSPs have had a limited impact on the wider universe of farmers. CACP’s rabi report for the 2019-20 marketing year, for instance, says that the number of farmers directly benefitting from the higher MSP has risen 94 per cent from the 2016-17 marketing season onwards - from 2.14 million to almost 4 million. Seen as a proportion of the total number of farmers, however, the picture looks less impressive. For example, though Uttar Pradesh accounts for around 44 per cent of the country’s wheat-growing farmers, only 7 per cent of them have benefitted from procurement operations. In Rajasthan, the figure is even lower at 4 per cent. In contrast, the CACP report shows that in Punjab, more than 80 per cent of the wheat farmers have enjoyed the benefits of higher MSP, though the state accounts for just three per cent of the country’s wheat growers. In the case of gram, 768,000 farmers benefitted from procurement operations in Madhya Pradesh during the 2017-18 rabi season, just 39 per cent of the total pulse growers in the state. Similarly, Nafed’s procurement of mustard during the same season benefitted only 250,000 farmers in Haryana and Rajasthan. Clearly, in the absence of expanded procurement operations, a higher MSP doesn’t amount to a radical improvement for most farm incomes. “This is turning out to be another year where farmer incomes would remain low. Higher MSPs have done little to lift crop profitability so far. In fact, wholesale (mandi) prices have been trailing the MSPs announced in July,” CRISIL said in a report released recently. This raises the related question: Is raising MSPs and expanding government procurement operations the answer to rising rural distress? Recent data show that average size of an Indian farm has shrunk almost 6 per cent between 2010-11 and 2015-16 to 1.08 hectares, increasing the number of small and marginal landholders almost 86 per cent and pushing farmers towards non-farm sources of income. At a time when almost 52 per cent of rural households are now dependent on non-agricultural sources of income, how far and how much MSPs can improve their condition is a big question. “MSP is obviously not the solution to address rural distress, but it is an important tool, provided it is supplemented by effective and expanded procurement,” Parvesh Sharma, a former chairman of Small Farmers Agribusiness Consortium, told Business Standard. “I feel the Price Deficit Financing Scheme (Bhawantar Bhugtan Yojana) and involvement of private players in procurement could play a big role in coming years,” he added. Avik Saha, convenor of Jai Kisan Andolan, says unless MSP is available for all crops, to all farmers as a matter of right through a law, it doesn’t matter whether you increase it by 100 per cent over cost or 200 per cent. “If the government can guarantee MSP as a legal right, it doesn’t need to give farmers any subsidies,” he says. The jury, then, is divided on the efficacy of MSP in addressing rural distress. But the data suggest that the current announcement for the rabi season barely skims the surface of the problem. 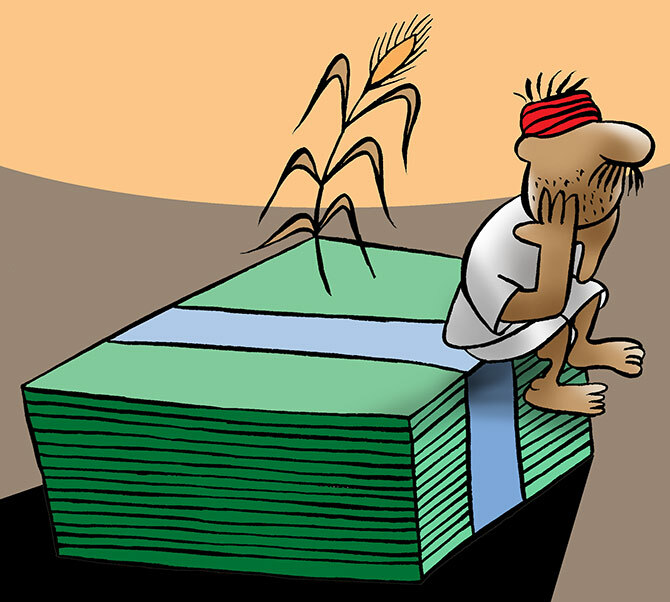 In spite of abundant agri products why are farmers unhappy?